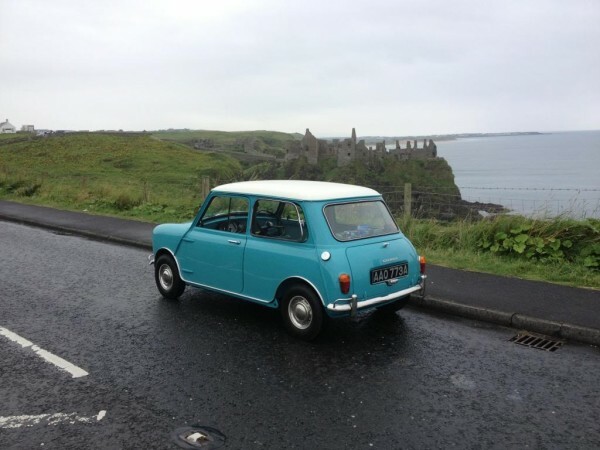 My love of Minis began at a very early age – there are photos of me at the tender age of two, sitting at the wheel of a new Clubman at the 1976 Motor Show. From then on, I was hooked. 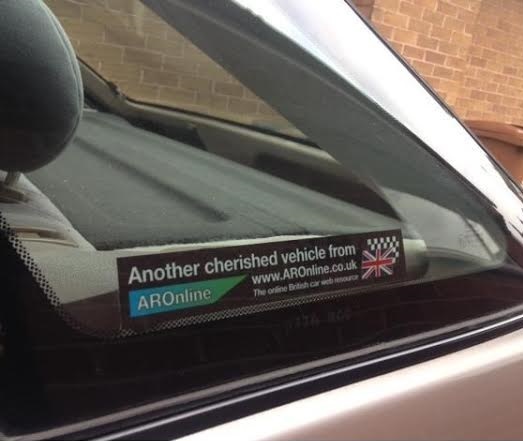 I couldn’t get enough car information and, by the age of three, I would amaze people with my ability to recognise just about every car on the road. Move on a few years and, when I turned 11, I was presented with the keys to a Mk3 Mini 1000, a running MoT failure rescued from a scrapyard. I learned to drive in this little car on the private lane and fields where I grew up – absolute heaven. This was followed by a Clubman and another 1000 from the same source – each being replaced when it became too rusty or worn out to fix. 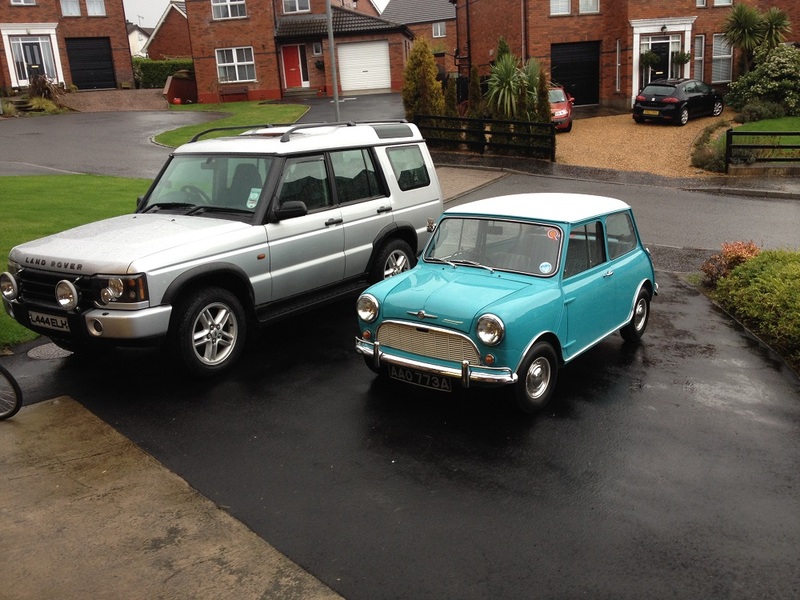 Having passed my driving test six weeks after my 17th birthday, a long stream of Minis came and went, but like so many others blokes before me, marriage, children and a grown-up job led to the Mini becoming unsuitable for family life. The final Sportspack Cooper, bought new by my wife just before our wedding, was sadly and reluctantly sold and we became Mini-less for the first time in many years. But the bug wouldn’t go away. I kept pining for another one, kept an eye on prices as they climbed ever higher and noticed the roads becoming bare of my favourite little car, that was once a common sight on every road. My dream had always been to have a Mk1 Mini, a Cooper or S and, at one time, I seriously considered buying one when they could be had for around the £10,000 mark. But it wasn’t to be then. Fast forward another few years to 2012 and the dreaded Internet became my fixation as I scoured classic car sales sites. I realised that, if I didn’t buy my dream car then, the opportunity would pass me by completely. I considered a project to restore. I’d been into mechanics and taught myself to weld fixing previous Minis, but when I did the sums and considered the time and money it would take I realised that buying a car already restored would make better sense (and I wouldn’t have to wait to use it). So after a little searching, I found the little beauty in the pictures. AAO 773A is a Morris Mini Minor Super de Luxe first registered on 18th June 1963 in Carlisle. It’s, in my biased opinion, the best colour scheme for a Mk1. The car was originally registered 14 LAO but sadly lost its registration number to a cherished transfer sometime in the 1990s. 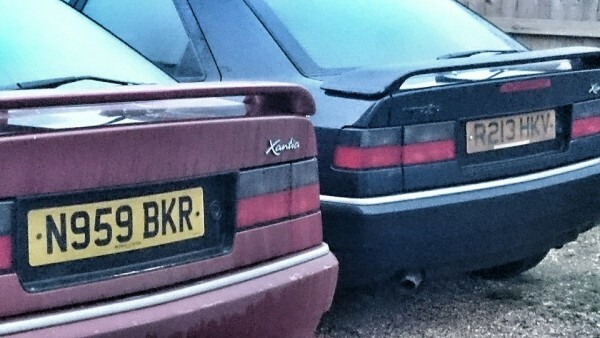 The plate is on a BMW 3 Series now – I’d love the opportunity to get it back! Sadly, despite writing to previous owners on the log book, I’ve been unable to learn anything of its history. 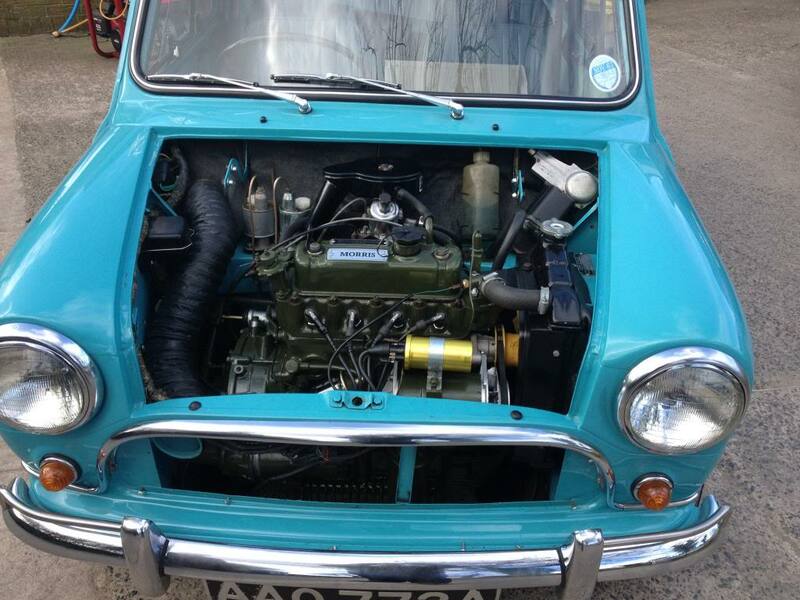 The Mini was restored the year before I bought it and seems to have been done to a fantastic standard. It’s all been done to original spec, except the front floor pans which have been repaired using flat steel sheet rather than the readily available correct floor panels. It seems strange to me that someone would go to so much trouble to rebuild a car and overlook a detail like that, but hey, you can’t see it unless you’re on your hands and knees – one for the rivet counters? I drove it 150 miles home with no troubles at all. The only issue was a crunchy gearbox, worn synchromesh on second and third gears. This was not a big issue, I learned to live with it, a job for a winter. All I did before starting to use and enjoy it was to fit front and rear seat belts. Again, I see the purists recoil in horror, but this is a car to use with the family and I wouldn’t have taken the kids out in it without them being as safe as possible. An electronic distributor conversion and a beautifully rebuilt 1 1/4″ SU carburettor had it running like a sewing machine, starting and idling so much more smoothly. It had a perfectly good new set of radial tyres fitted, but I decided to go down the retro road and fitted a new set of crossply tyres – they improve the looks no end and make wet roundabouts an interesting experience. The niggling gearbox problem and a little 20w50 incontinence problem (the Mini, not me) gave me a winter project. I found a secondhand gearbox at the right price on a well-known Internet auction site and bought it in the hope that it was better than mine. I decided to fit it along with a new clutch on the basis that if it worked properly all well and good and if it didn’t, all it would have cost me was my time and a set of gaskets. As it turned out it was perfect, £70 well spent. While I had the engine out, it was stripped and wear and tear items replaced. 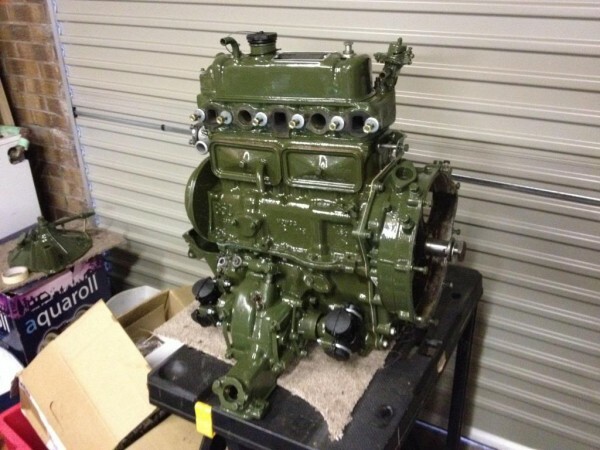 New oil pump, water pump, timing chain, thermostat, valve stem oil seals, valves reground etc. It was then built back up and repainted in glorious BMC engine green. Since then it’s been great, still leaks a little oil but that just keeps everything underneath coated in a protective mist. I use it, not as often as I would like but I like to keep it immaculate and generally don’t use it in the wet unless I’m going to a show when it always seems to be raining. Its little 850 is no ball of fire but potters along nicely around 50 – 55 quite happily, making everyone who sees it smile and wave. Every time I park up or stop for petrol there’s the inevitable conversation with people reminiscing about their Minis of old. It’s a pampered article these days and lives in the garage. It’s rarely out in the winter and never on salted roads. I hope it’s going to be around for another 50 odd years and that my kids can enjoy it as I do. I have no plans for it in the future, other than maintaining it. Sometimes I think about 1275 engines and Cooper S disc brake conversions but, in reality, that would be totally wrong for this wee car – I’ll keep it as Issigonis intended! What a smashing little car. 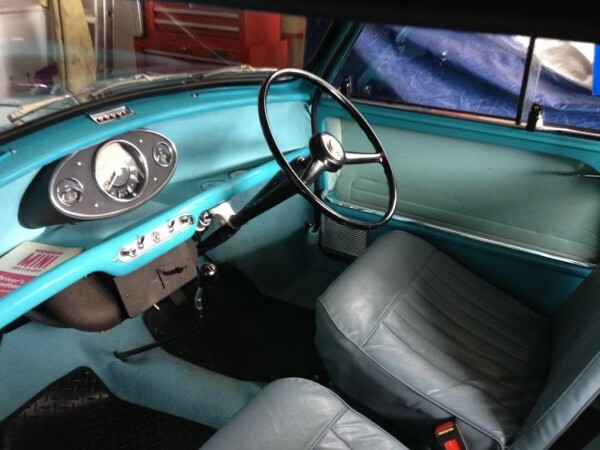 There is much to be said for the more basic versions of the Mini- although being a ‘Super de Luxe’ presumably came with one or two extras- a heater maybe? Personal taste, but I think I’d have stuck with radials though! I should also have added that the opening rear windows were a Super de luxe feature ; I can’t remember whether a heater was standard on them but I suspect not ! I believe the Super Deluxe is a Cooper without the Cooper engine, gearbox and brakes. It had an 850, luxury interior and plenty of shiny bits, plus of course the dual tone colour scheme. A heater was standard but fresh air vents and radio were optional. The Super Deluxe is a combination of the Super and the Deluxe models which preceded it, as I guess it seemed silly to have two luxury trim models competing with each other. All were fairly short lived so now very rare! 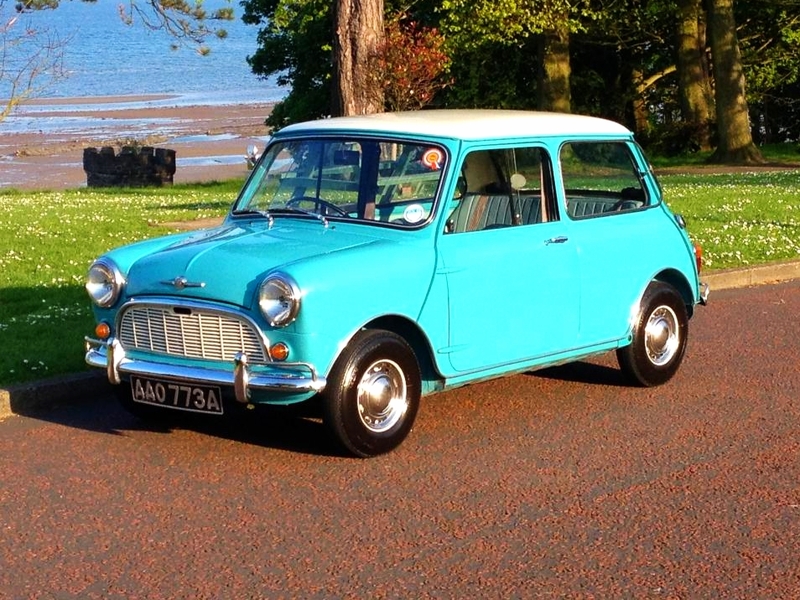 Lovely story and a lovely car – I like that colour scheme! My first car was a 67 white Austin Mini 850 which I only kept for 10 months but will always have fond memories of. I freshened up the paintwork, added new wheel trims and wheelarch chrome trims. It had the single speedometer, a heater with a single speed flick-switch and a radio… happy times. Good luck Gavin. One very clever use of space and a way of cutting costs is the space where the glove box would be on more expensive cars, which is enough to hold a road atlas. Basic, but so weren’t most small cars then? Love the pic beside the Disco. Emphasises the diminutive size of the mini, it’s easy to forget just how small and low they are. Never have liked Minis BUT it is very nice to see a classic car that has been very nicely restored…..and I like the colour. A lovely car. 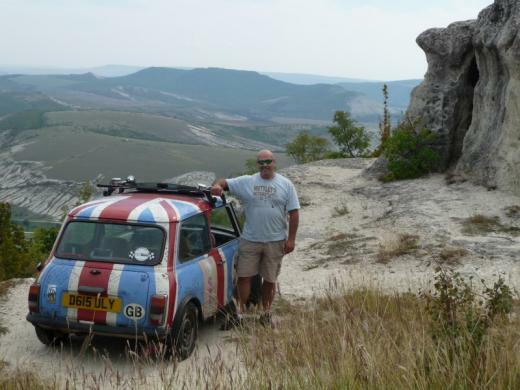 Minimal motoring – you can’t beat it!